Industrial pumps are major devices used to move various liquids or gases to a specific location. There are several different types of pumps that are used and need repair services. 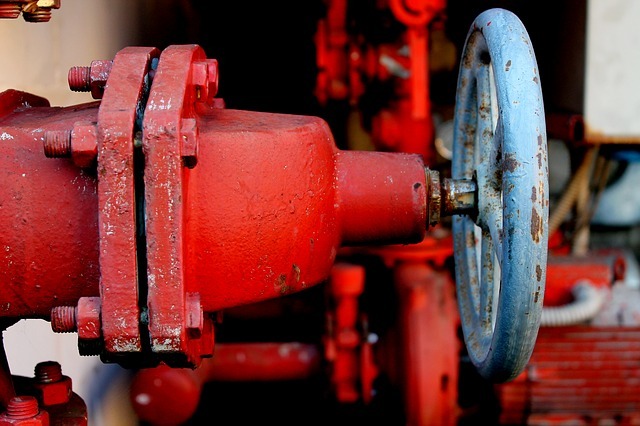 An industrial pumps service in NYC can't be performed easily by a small plumbing company. Industrial pump repairs require a high level of experience, in which you will need a professional industrial repair company. NY Pump & Motor Repair's professional pump staff has been providing industrial pumps services for many clients throughout New York City since 1941. When repairs are needed for any industrial pump, it is important to get a certified pump technician to complete the job correctly. There are a variety of industrial pumps used through New York including water booster pumps, gear pumps, sump pumps, positive displacement pumps and more. Businesses that have industrial pumps and motors cannot afford to have their machines broken for long periods of time. We understand that pump issues can happen randomly, which is why we offer 24/7 pump services for your convenience. 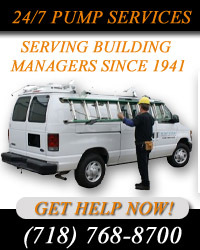 When you call us you can be rest assured that we will diagnose the problem quickly and make the necessary repairs. As a family-owned and operated company, our staff is highly trained and has extensive knowledge of a wide selection of pumps and the repairs they may need. We pride ourselves on customer service and work hard to ensure that our customers are satisfied with their industrial pumps service in NYC. For more information about our industrial pumps service in NYC, contact NY Pump & Motor Repair at (718)-768-8700. NY Pump & Motor Repair - Your trusted source for Industrial Pumps Service in NYC. Every piece of equipment in the world has a life and the condition for it to work well in its lifespan is to make sure it is taken care of, which includes its usage as described in the manual and having it thoroughly inspected by professionals if you feel it is not working well. If something doesn't feel right with your commercial pump it probably isn't. There can be many things wrong with your pump as they are complicated machines. Instead of trying to tackle this problem with limited knowledge, it is highly recommended you seek the help of our professionals at NY Pump & Motor Repair for commercial pump repair in NYC. Our company hires skilled staff with experience of dealing with any kind of repair issue. We provide you with a complete rebuild and new part options. The repairs begin with a full inspection of the pump and through a thorough examination to determine not only the present problem but we dive deep into the roots of the problem to make sure it does not happen again. At NY Pump & Motor Repair will provide you a through the report of our examination and the steps that will be taken to make the pump new again. After you have agreed with the course of action our skilled workers will start working on the repairs. Upon completion, a whole set of suggestions will be given to you for its future use and care. So, whether its water, vacuum, heat, or any other type of pump we are professional to handle it with excellence and efficiency. We also provide installation services. You can easily come anytime and visit our office or you can call and inquire our process and operations. To get an appointment call us now. We offer reasonable rates to our customers as our main focus is only on delivering you with the best quality of work and ensure safe and easy living. For more information about our commercial pump repair in NYC, or to learn more about us at NY Pump & Motor Repair, feel free to call us today at (718) 768-8700. One of our pump repair experts will be happy to speak to you. We have the ability to provide households with swift pump installation services. If you are experiencing issues with your pump, it’s crucial to employ one of our capable individuals to fix the problem in the shortest time possible. Problems might appear, simple and easy at the first time, but becomes complex when you try the do-it-yourself method. Sump pump experts know how to diagnose the problem and how the handle electricity and water to avoid further damage that can lead to a greater expense. At NY Pump our professional pump installers has excellent knowledge regarding pump installation. They know the appropriate kind of pump for your household, how to utilize the pump and to repair any related issue that may occur. When you need a pump, they know exactly what you need and if they are out of stock, they know the best alternative to the one you need. A great part of hiring a pump installation specialist is the personalized advice. Before employing a sump pump, you need to get a tailored advice regarding your home and the kind of pump you need. It is beneficial when you have outdated home pipes or if your home needs some drilling to install the pump. We provide specific recommendations regarding the pump and how to maintain it. When you hire our specialists for your pump installation project, you will have professional and satisfying services. They offer tips about the pumps, the available updated versions, and parts. This assists you to budget yourself and save a large amount of money on the expenses, and get professional and satisfying services. Without a doubt, every time you have pump installation project or you are facing any pump related issues, seek the service of a qualified pump installation expert. To learn more about our pump installation in NYC, or for more information about us at NY Pump, please call us today at 718-768-8700. One of our pump experts will be ready to speak to you. Today we at NY Pump & Motor Repair would like to discuss the importance of condensate pump repair in NYC. The condensate pump is a vital piece of your HVAC. As it cools, your HVAC produces buildup. The system relies on gravity and a 3/4 inch to guide the water to the outside of the building. Condensate pumps consist of three parts: the buoy, the supply and the pump. All the parts work together to reduce and eliminate the build up. As the build up level rises in the supply, it lifts the buoy which activates the pump. As the build up is cleared, the buoy moves back down, deactivating the pump. The evaporator/boiler pressure is too high. The condensate pump's job is to to deliver the condensation away from the pump. For this to work it needs the pressure to be higher than the pressure in the boiler. As a general guideline, the heater functions at around 50 psi or less. On the off chance the heater is over 50 psi, the pump should release at at the pressure of the boiler. This could be an extra 10 psi over the usual 50. The condensate is too high for the pump to work. As the steam is trapped, the pump should sizzle. In the event is too hot--close to 190 degree Fahrenheit, the pump may cavitate when it runs. Cavitation is what happens when the radial pump tries to pump water and the water flashed into vapor. This may sound like rocks traveling through the pumps. When the water is in its vaporized form at a very high temperature it can actually eat away at the metal propellers and damage the pump. For repair, you'll need to have the damaged steam traps repaired or replaced by an expert. At NY Pump & Motor Repair we have been making simple fixes as these and complex pump repairs since 1941. Call us today and we'll be right with you. Condensate pumps are dependable and an essential part to the entire pump system. As part of their routine upkeep they should be regularly maintained and repaired. If a condensate pump is left without a repairs water can flood inside the building and rack up water damage costs. As a preventative measure, simply have your pump cleaned and maintained by professionals like us. To learn more about our condensate pump repair in NYC, please call us today at 718-768-8700. One of our pump experts will be happy to speak to you. Pumps in New York City do an enormous amount of work every day. New York is the biggest city in the USA and any heavy machinery has to work extra-hard to meet up with New York’s deluxe-sized demand. And that heavy demand in turn leads to an awful lot of punishment on your pumps, sometimes to the point where they decide to give up and stop working. The first thing you should do when investigating problems with your pump is to turn it off. First of all, pump problems can get worse if they are allowed to continue to run when they aren’t doing their job. Secondly, failing to power down your pump can actually cause it to injure you. Pumps are motorized devices, just like you don’t want to get your hand caught in your car’s engine when it’s running, you don’t want to get yourself caught in heavy pump machinery while the motor is running. Take the necessary precaution. Shut it down. Many home and business owners think they or their supers can make the repairs themselves, and, while they might do a good job with other repairs, a pump is an especially sensitive and powerful piece of machinery. Lack of training can cause you to damage your pump in the effort to fix it or, worse, damage yourself. Don’t act in a manner that will only increase the cost of your pump repair or, heaven forbid, increase your medical bills. Call a professional. Your pump is an important part of your operation and cutting corners with water heat, sewage, or other systems in your building is not worth risking on the lowest bidder. This is one of those cases where spending a little more money today saves you a lot more money in the long run. NY Pump has been handling Pump Repair in NYC since 1941. Our pump repair engineers are experienced, qualified, and efficient. They can be relied upon to get the job done right. 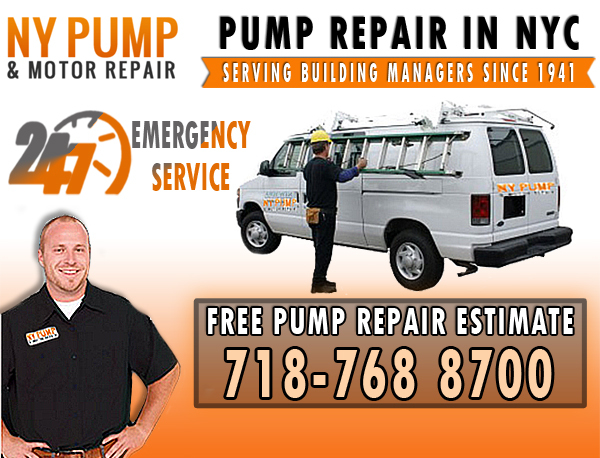 To call NY Pump for a Pump Repair quote in NYC, any hour of the day or day of the week, dial (718)768-8700.